The closer we approached to the ocean, the louder and clearer became it's sound. However, all the time when we stopped for short photo shoots, it seemed that it was not an ocean, but the sound of the other car behind the dunes. After passing about a kilometre, Alex has decided to reduce the tire pressure, as the road became more rocky and sandy. 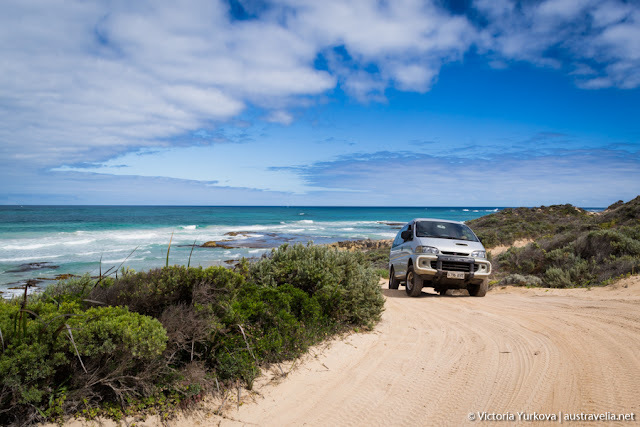 While he was busy with the wheels, Victoria, along with the camera went to explore the dunes, and, when climbed several metres, joyfully shouted that she saw the ocean. In the gap between two dunes shining blindingly blue ocean waves crashed with foam and spray. As it turned out, we stopped at the fork of two roads. One of them, rocky, looking like composed of orange brickbats led somewhere upwards, the second one, more sandy, led to the shore through a pretty dirty puddle. As soon as we drove up to it, we saw a caravan of oncoming vehicles. They overcame this obstacle with a loud splash. Drivers waved their arms in greeting, and reported that the puddle was not too deep. 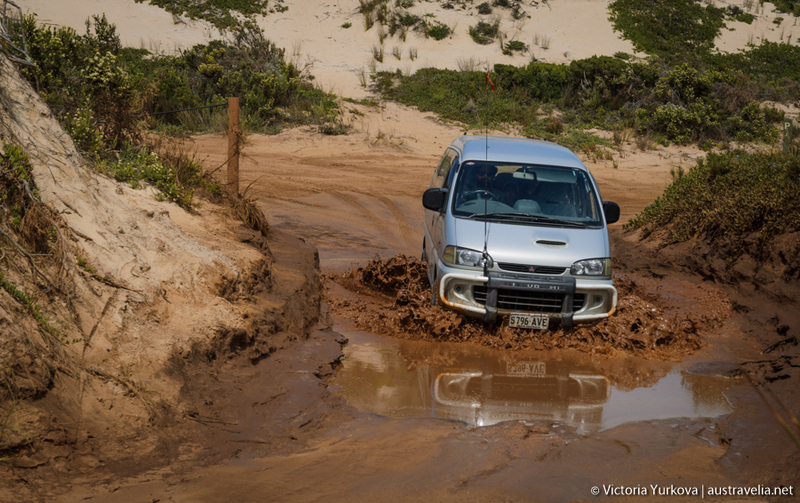 However, they suspiciously glanced at our van, as some people do not admit that this vehicle could be 4WD. Well, we successfully overcame this puddle, too - only fat brown waves scattered in all directions - and pulled up to the shore. At this point, the beach was decorated with picturesque rocks and stones lying around in the sand. The children immediately arranged a fun bustle in the water, running around and hiding among natural shelters. There were a variety of lovely shellfish sitting here and there on the rocks. Suddenly Victoria felt her love to the seaweed, and said she would like to try some fresh seagrass. At her request, with a lot of effort, Sasha tore a long strip of some marine delicacy. This seaweed did not want to be torn off, and as a result, springed back like a rubber band, and hit the poor child. Seaweed was quite thick, tough, salty, and surprisingly delicious. However Victoria just tried a small piece, judging rightly that first of all she needed to check, whether it was non-poisonous. We drove a little further, the road was quite simple, sandy, but all the time at a different angle to the horizon. Here and there we came across rocky areas, where we had to drive carefully so we were not hooked to some rock. At one of the passes the entire surface was covered with flat round shells around 1.5-2 cm in diameter. On one side this shell had an elegant curl on a flat and smooth surface, on the other side the surface was rough and slightly convex. For some reason we thought that they were fossils, but I'm not sure that we were right. Among them there were other shells that looked like houses of large grape snails, they were black, striped, and looked very expressive. From the same site we could see a scenery ocean view and beautiful rocks somewhere below on the shore. We reached a lovely, bright, almost deserted sandy beach. Only a lone fisherman fished with a giant sea fishing rod at the beginning of the beach. 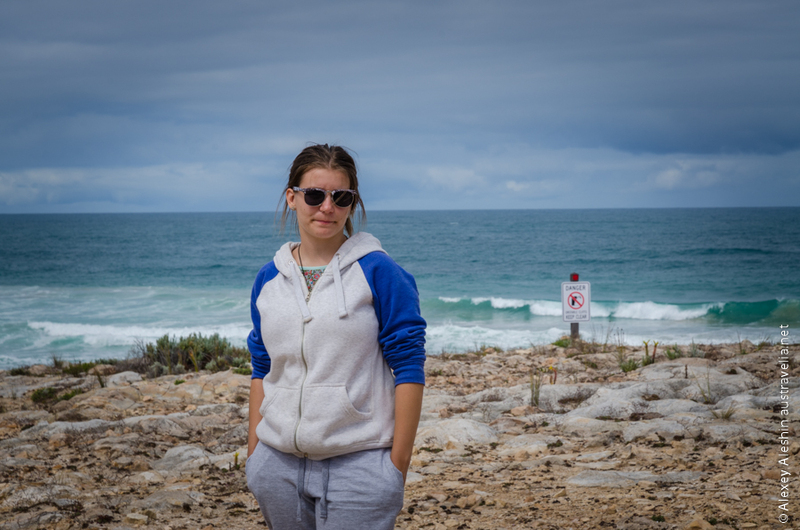 Once we went to the flat sandy beach, Maria, who recently received her learner's driving license, immediately declared her rights. She pulled out her yellow learner's plates and asked for the wheel. Victoria prudently jumped out of the car with the camera, but the children were asked to stay inside. While they are fastened in the car, nothing would happen to them, however on the beach they would immediately run away, like cockroaches. Our happy learner drove about back and forth along the shore for about a half an hour, the other children shouted excitedly in the vehicle, and Victoria was running around taking photos of this lesson. Then, out of the blue, speeding down the hill, three 4WD vehicles swept past us, raising clouds of sand. They probably chased on the deserted beach. Seeing the Learner plate and a young driver, drivers lifted up their thumbs with approval, waved their hands. After a moment they vanished into thin air. Driving Lesson on beach! Sounds simply amazing. I am learning driving from a Port Macquarie Driving School and will love to have some lessons beachside. Will definitely talk about this with my instructor. Quite sure he won’t have any objections. Great post! 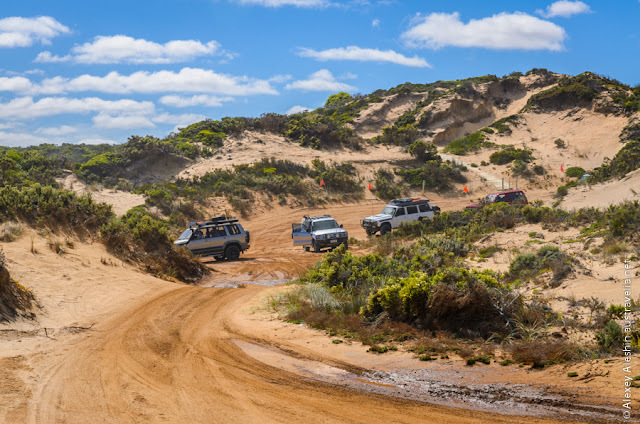 Superb techniques for 4WD.